The set offers more skin tones, gender neutral options, and a banjo. Emoji fans will have a smile on their face when they see the final list of 230 new emojis approved by Unicode Consortium. Set to appear on major platforms later in the year, the new emojis include greater representation for people with disabilities, as well as more inclusive gender couples and a wider range of skin tones. The update, known as Unicode 12.0, is the sixth major emoji release, with the last taking place way back in 2014. Emojis have come a long way since their humble beginnings as pieces of pixel art, and anyone keeping a close eye on them will know that updates to skin tones, hair colour and more gender inclusive designs have been introduced gradually over the last five years. However Unicode's announcement yesterday suggests that the documentation for all of the new emojis is ready to roll out in one go. The batch is made up of 59 individual new emojis, but when all 171 gender variations and skin tones are taken into account, users will be able to choose from 230 options. 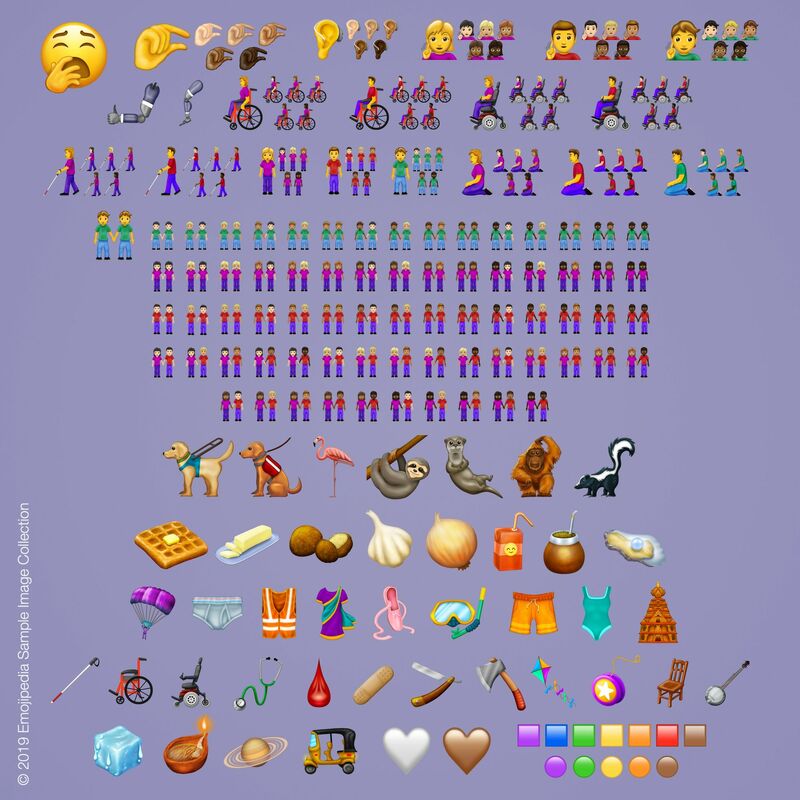 Check out the full set of 2019 emojis in the image below. The good folks over at Emojipedia have also previewed the differences in emoji designs as they appear across Android and iOS. If you like the look of these emojis, you won't have to wait long to start using them. Unicode Consortium will release them on 5 March 2019, and they're expected to appear on major operating systems in the second half of the year.